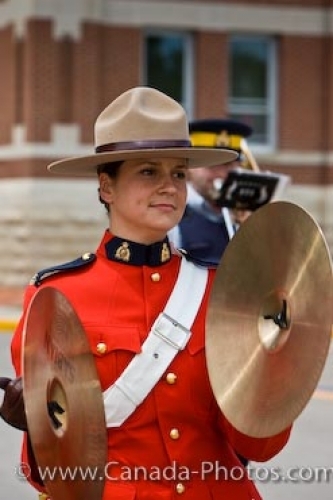 As the band at the Sargeant Major's Parade marches at the RCMP Academy in Regina, Saskatchewan in Canada, a woman band member dressed in uniform, plays the cymbals. The graduation ceremony is always a celebration for these people and the members of the band are volunteers who attend the Academy. The Basic Recruit Training Program held at the Academy is a 26 week program where hard, rigorous exercise, discipline, studying and eating takes place. The uniform which each member of the band is dressed in symbolizes the stage of training they are in. In the last week of their training at the RCMP Academy, they graduate to wearing the Stetson hat. Band member playing the cymbals during the Sargeant Major's Parade and Graduation ceremony at the RCMP Academy, City of Regina, Saskatchewan, Canada. Picture of a member of the band at the RCMP Academy in Regina City in Saskatchewan, Canada.